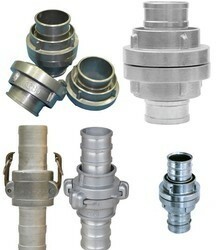 Our range of products include hose couplings. This commendable range highly asked for and acclaimed in the market is made up of products like Air Compressors, Air Compressor Spare Parts and Heat Exchangers. These products are manufactured by us using the finest raw materials and modern machines, in accordance with the set industry norms and guidelines, for quality standardization. Its superior functionality and performance is highly acclaimed in the market. Further, the offered range is marked at the best rate possible, for enabling maximum client satisfaction. Looking for Hose Couplings ?